Ideas, policies and strategies for positive and sustainable change. 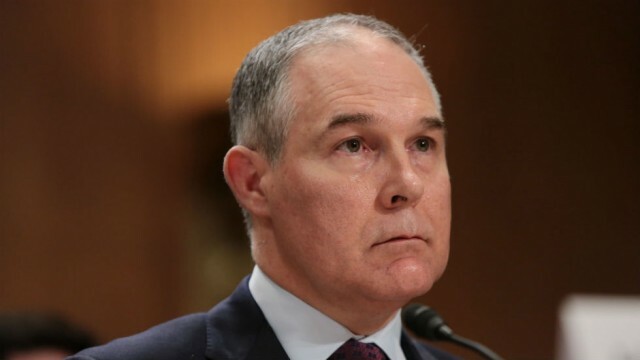 The new head of the US Environmental Protection Agency, Scott Pruitt, does not believe that carbon dioxide pollution is a major cause of climate change. In an interview with CNBC the Donald Trump’s appointee said “I would not agree that [carbon dioxide] is a primary contributor to the global warming that we see. 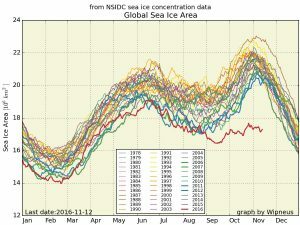 But we don’t know that yet, we need to continue to debate, continue the review and analysis.” In other words, as we reach 410ppm of Co2 in the earth’s atmosphere, we need to continue to deny, delay and dither. Scott Pruitt doesn’t know what’s going on. Pruitt is denying the reality that Co2 causes climate change because he cannot imagine a solution that doesn’t involve state control over the market. He’s basically choosing values or ideals over reality and truth, at least strategically, because he sees the situation as zero-sum and either/or. He cannot imagine a perspective on climate change that includes both a free, healthy and prosperous market, and rapid and meaningful reductions in Co2 emissions. But there is such a solution. It’s being promoted by the likes of former GOP Secretary of State James Baker, former GOP Secretary of State George Shultz, and former GOP Secretary of the Treasury Henry Paulson, as well as by former NASA scientist and early climate activist Dr. James Hansen. This plan puts money into the pockets of nearly two thirds of people, powerfully incentivises the market in the direction of carbon sustainablity, and can be implemented gradually without sudden economic or market shocks, all through existing laws, institutions and structures. It does not increase government, but it does increase economic growth. It provides the nucleus and start of a Basic Income (the Baker-Shultz plan starts at $2,000 per family per year). It encourages and enforces environmental responsibility while expanding real, tangible human freedom. 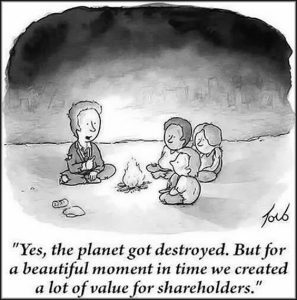 That solution is revenue neutral carbon Tax and Dividend, in which a large and growing tax is placed on fossil fuels as they come out of the ground or arrive in port, and the proceeds from this tax are then distributed to everyone, equally. Essentially, you pay for your pollution, I pay for my pollution, and we’ll split the proceeds equally. It’s simple, it’s easy, it’s fair, it’s practical, it’s economically realistic and it’s politicaly realistic. And it’s the only chance we have of getting our global carbon emissions under control before we damage our planet for thousands of years (which in real, human, terms means ‘forever’). Like it or not, Trump and Pruitt are in government and so they have to be sold on this plan. Jim Baker, George Shultz and others within the GOP are pushing carbon Tax and Dividend to Donald Trump. Elon Musk, a member of Trump’s tech advisory group, is pitching the plan. There are currently 13 GOP members of the bi-partisan ‘Climate Solutions Caucus‘ in the US House of Representatives. Rex Tillerson, Trump’s Secretary of State, is the man who turned Exxon’s climate policy from denial and delay to carbon Tax & Dividend. The California State Legislature has passed a resolution supporting carbon Tax & Dividend, as have 43 cities and municipalities, including Philadelphia, San Francisco, Pittsburgh and Portland. There is real political movement in this direction. These two? Really? Wow! Maybe it’s obvious? Make no mistake – we NEED a price on carbon as quickly as possible. Cap and Trade is a complex and opaque mess of entitlement, speculation and perverse incentives in which prices rise, and big business takes the money (whether to improve carbon efficiency or not). Straight carbon tax is a government grab in which prices rise, and the government takes the money (whether to invest in renwables or not). With carbon Tax & Dividend though, prices still rise – but YOU get the money. Gas and heating cost more, but you also get a check in the mail. For most people that cheque will more than cover their higher prices – and the more they switch to lower-carbon alternatives, the more extra money they’ll have in their pockets. Distribution would be from heavier polluters to lighter polluters. Sustainable behaviour would pay. Something significant changed in the Arctic last winter. Soon it may be too late. 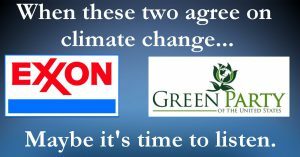 Democrats, NGOs and others concerned about climate change should be supporting the efforts of Jim Baker, George Shultz, Elon Musk, the members of the ‘Climate Solutions Caucus‘, the Citizen’s Climate Lobby, and others attempting to turn carbon Tax & Dividend from an idea into a law. The time is late. This is the policy that has the best chance of saving us in the time we have left. It is urgent, it is fair, it is realistic, and it has bi-partisan political support. Get behind it. We need to do this now.